While the report does not identify the nature of the “high energy objects”, the assessment suggests that the plane was perforated by “a large number” of unspecified projectiles or “bullets”. This preliminary assessment including photographic evidence does not suggest that the plane was hit by “one or more” missiles, which is Washington’s official version. As we recall, Western governments as well as the mainstream media blamed both Moscow and “the Russian-backed rebels” and claimed, without a shred of evidence, that a Russian-made Buk missile was responsible for the plane crash. These allegations were then used as a pretext to justify a series of tough economic sanctions against Russia. An important question emerges: In the light of the DSB report findings, will president Obama retract his accusations directed against the Russian Federation? As yet it has not been possible to conduct a detailed study of the wreckage. However, the available images show that the pieces of wreckage were pierced in numerous places. The pattern of damage to the aircraft fuselage and the cockpit is consistent with that which may be expected from a large number of high-energy objects that penetrated the aircraft from outside. It’s likely that this damage resulted in a loss of structural integrity of the aircraft, leading to an in-flight break up. This also explains the abrupt end to the data registration on the recorders, the simultaneous loss of contact with air traffic control and the aircraft’s disappearance from radar. There is no mention in the DSB report of damage caused by a missile. The word “missile” does not appear in the press release. Moreover, the DSB –which was no doubt under political pressure– fails to clearly identify the nature of the “high-energy objects” which penetrated the aircraft. 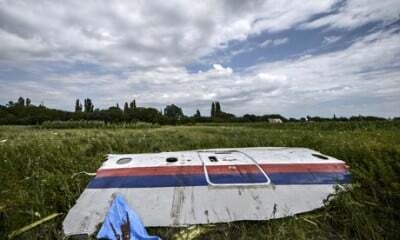 In a twisted logic, several mainstream media have intimated that the DSB findings pertaining to the “large number of high-energy objects” which penetrated the aircraft confirm “the suspicion that the plane was brought down by a BUK surface-to-air missile, which breaks into shrapnel shortly before it hits its target.” It is unfortunate that the Prime Minister of Malaysia has endorsed this biased interpretation and has signified that the DSB’s preliminary report suggests that the MH17 was downed a surface to air missile. 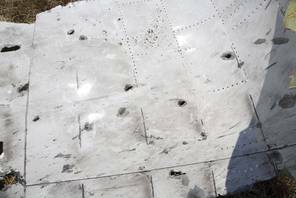 While there is evidence of perforations resulting from shrapnel, the small perforations are machine gun like bullet holes pointing to an attack by a military aircraft. These holes could not have been caused by a missile explosion as hinted by the MSM in its coverage of the DSB report. Global Research will provide further analysis on this report in the coming days.